A plague is sweeping your production floor. The plague concerns the buildup of production waste. It can unnecessarily tie up expensive personnel while they perform the task of waste removal. It can contaminate your quality product. The plague can zap the energy and strength from your operation and interfere with your corporation's ability to deliver quality, cost-competitive, and timely product. 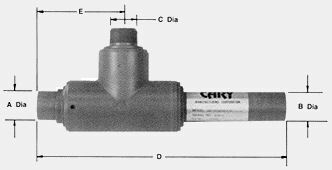 The Cary Aspirator System can be a major part of the cure for the plague. The Cary Aspirator enables manufacturers to perform in-process cleaning of lightweight scrap materials encountered in the production process. Designed for use with an efficient, high volume, low pressure ring compressor (such as those supplied by Cary Manufacturing), the Cary Aspirator creates an effective method for the disposal of light weight materials such as textile trim, paper, film, dust, and a variety of other materials. The aspirator then conveys the materials with high volume, high velocity air to a container located away from the production process. The result is a cure for the plague with minimal initial cost, and minimal system maintenance. Other Cary Manufacturing products and services include: a line of portable dry vac systems, selvage/trim removal, centralized vacuum systems, customized material transfer equipment, electrical start-stop stations, SS and aluminum air knives, custom and standard in-process waste removal equipment. Cary Manufacturing is at your service to provide your corporation with the necessary applications engineering to satisfy your process needs. Whether you choose our standard product offerings or a custom waste disposal/material transfer system, Cary dedicates all products and services to providing your organization with the most efficient and cost effective method of waste disposal or material transfer.